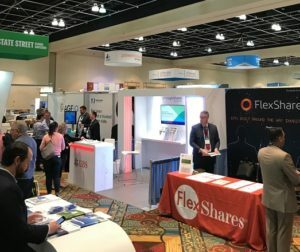 The 2018 edition of the world’s largest ETF conference featured 2,500+ attendees, 200+ experts on everything from the SPDR S&P 500 ETF to hidden gem ETFs you’ve never heard of, an exhibit hall where nearly every ETF provider was well-represented, and a star-studded lineup of keynote speakers including Mohamed El-Erian, General Stanley McChrystal, Quincy Jones, Serena Williams (who was masterfully interviewed by Barry Ritholtz), and the Daily Show’s Roy Woods Jr. & Michael Kosta. 1) Fee focus shifts to financial advice. While ETF price wars and a race to the bottom on fees dominated conference conversation in years past, that wasn’t the case at this year’s event. Instead, the fee spotlight shifted towards financial advisors. Michael Kitces laid out the raw, bold truth that as technology commoditizes more advisor activities (think portfolio construction, rebalancing, tax management), advisors best be prepared to clearly articulate to their value proposition and justify their fees. “Financial Advisor” of the 70s/80s —> STOCKBROKER! “Financial Advisor” of the 90s—> MUTUAL FUNDS! “Financial Advisor” of the 2000s —> ASSET ALLOCATION! That sentiment was echoed by new Vanguard CEO Tim Buckley, who delivered the conference’s opening keynote address. He presented data showing 58% of advisors are susceptible to losing their jobs to automation. For those advisors able to survive, Buckley said to expect downward pressure on fees. That said, Buckley encouraged advisors to embrace technology, rather than fear it. Successful, forward-thinking advisors will leverage technology to free-up time to focus on more value-added activities for their clients – things like managing behavior and developing custom solutions (both of which are tough to code for). The bottom line: If you’re an investor paying for an advisor, make sure they’re providing value commensurate with their fee. If you’re an advisor – you better leverage technology and have a compelling value proposition! -Bloomberg’s Eric Balchunas said “90% of media coverage on ETFs is on stuff that makes up 5% of your portfolio”. Don’t forget that. While niche ETFs make for interesting stories, most sensible investors know these should represent no more than a small satellite position in a portfolio. Used correctly, thematic ETFs can add some diversification and a little upside. Getting caught-up in the media coverage and overdoing it with thematic ETFs will likely end poorly for investors. -While some in the financial media and ETF industry panned the thought of a Quincy Jones ETF, I thought Donna Nairi, CEO of ICONICBETA, made an extremely important point (and one that hits close to my heart): a lack of financial literacy and general interest in investing is a real problem in our country. If an ETF can help spark that interest and get people more excited and engaged to learn about investing, that’s a net positive. I couldn’t agree more. 3) Victory is yours, iShares and Vanguard. Speaking of innovation, I think one of the reasons we’re seeing blockchain and marijuana and Quincy Jones ETFs is because there is zero appetite among ETF providers to compete with the big boys in areas of the market already well-spoken for. My sense, from numerous conversations I had this week, is the ETF industry has ceded victory to iShares, Vanguard, and StateStreet (who was celebrating 25 years of SPY, by the way). You could also toss in Schwab ETFs for advisors on Schwab’s platform. The fact is you’re not going to compete with them on price for plain-vanilla market exposure or scalable smart beta products. The big boys may continue to beat each other up, but don’t look for upstart ETF providers to pick a fight. The benefit to investors is they have extremely low cost access to broad markets and strategies, along with thriving ETF innovation in areas beyond. 4) Millennials love ETFs. Last week, BlackRock released a survey on ETFs showing millennials are leading the ETF charge. While I think it’s fairly well-known that millennials are huge proponents of ETFs, there was an interesting piece of anecdotal evidence that came out of the conference. My wife made the trip down to Florida with me to get a much needed break while I did the conference grind. She attended several happy hour events and was taken aback at how young and energetic the conference participants seemed. She was anticipating lots of gray hair and bad suits. Instead, she unexpectedly found a young and rather hip crowd. She said she felt old (never a good thing of course, but you get my point). That, in a nutshell, is why ETFs are the future. 5) Commodity ETFs making a comeback. While my own meeting agenda likely colored my perception, there was significantly more commodity and commodity ETF talk this year. I had an opportunity to meet with PowerShares Global Market Strategist Jason Bloom, along with GraniteShares’ Founder & CEO Will Rhind (who in my opinion is a rising ETF star – if he’s not already one). While neither were making market calls, both expressed optimism on the potential of the broad commodity space, which comported with several other conversations I had. I don’t recall this much commodity talk at the conference since the early days of QE, when everyone was predicting rampant inflation. With better structured and lower cost commodity ETFs now available, this past week indicated to me that 2018 could be a breakout year for these products. All in all, it was a highly successful conference. 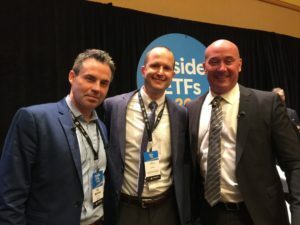 Inside ETFs runs a first-class event, and it was wonderful meeting so many industry thought leaders in person. I’ll close with a comment from WisdomTree CEO Jonathan Steinberg in one of the final sessions on Tuesday: “The ETF structure is the future of asset management”. I’m already excited for 2019’s Inside ETFs.